Earlier this year Room to Grow conducted a survey on discipline, asking parents from across the UK to answer a short series of simple questions on how they discipline their children and on their general attitude towards discipline, more than a 1000 parents responded. Requesting an apology was found to be the most common disciplinary action, with a massive 52% of parents always ensuring that an apology is offered and 31% often doing so. Dads are less likely to get their child to apologise, only 69% of Dads, as opposed to 83% of all parents. Looking at the responses from a location point of view, Welsh parents are most likely to promise a treat or privilege for good behaviour (92% claiming that they always, often or sometimes use the treat technique as opposed to 83% of all parents) and 44% of those Welsh parents rarely or never threaten punishment over double the rest of the UK. 26% of parents in Scotland admit that they rarely or never express disappointment as a disciplinary measure, slightly higher than the overall total of 22%. When it comes to gender, it’s not just in the apologising department that we see differences between the way Mums and Dads approach discipline. While 48% of Mums declare that they always teach children about good and bad behaviour, it seems that Dads are a little less on the ball with only 26% teaching their children about good and bad behaviour. It seems like Mums also have the upper hand when it comes to threatening punishment – 26% do so compared with a paltry 15% of Dads. Fortunately, 58% of parents claim never to smack their children with only 2% admitting that they often smack as a method of dishing out discipline. It seems that parents have finally got the message that smacking is unacceptable, with 88% of parents in Wales and Scotland and 87% of parents in England revealing that they never or rarely smack as a discipline technique. While a parents’ relationship status (married, divorced or single) did not seem to affect the occurrence of disciplinary techniques, neither does their educational status come into play much here, except in the issue of expressing disappointment. While 10% of University educated parents tend to always express their disappointment in their child’s behaviour and 31% often do, in non University educated parents the numbers are 9% and 27% respectively. 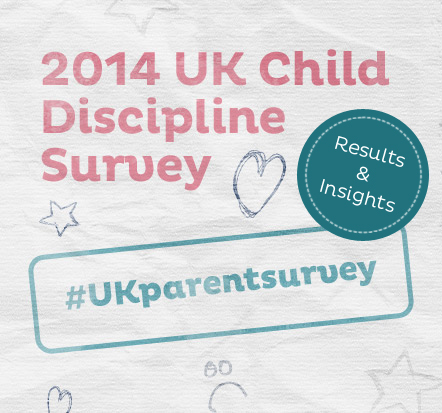 The majority of parents asked (77%) describe themselves as moderate when it comes to discipline, although 11% describe themselves as strict and 12% as lenient, so it looks as if parents across the UK are on the same page when it comes to moderation. Most parents agree that discipline is an important factor in raising children, 40% say it’s essential and 43% think it’s very important. Only 2% of parents seem to think that discipline is not an important part of raising children. Disciplinary techniques are dished out on a daily basis in 30% of households and weekly in 20%. Some lucky parents only need to use discipline sometimes (37%) and only 3% never discipline their children. When it comes to parents presenting a united front and agreeing on discipline strategies, 38% of respondents sometimes disagree, while 28% rarely disagree. 5% of parents admit to always disagreeing with their spouse on disciplinary strategies and 12% often do. However, 60% of parents allege that the role of disciplinarian is shared with the rest being disparately split – Mums in 30% of cases and Dads in only 10%. As for whether discipline techniques differ according to gender, a massive 49% of those asked said never, 17% claim rarely and 27% sometimes. Of the remaining 7%, only 1% thinks that discipline techniques always differ between the genders. These figures demonstrate that discipline is still very much present in households across the UK, which should mean a nation of children developing into adults who know how to behave well and going on to become valued members of society. It’s particularly gratifying to see that smacking as a disciplinary technique has been losing ground in the popularity stakes, with only 4% admitting that they always smack and 23% always yell or scold when disciplining their child. Modern parenting methods (and experience) tell us that by smacking a child you are teaching the child how to smack and by yelling you are teaching the child to yell back. One of the most effective strategies when teaching children right from wrong is to act as a good role model – show your children how you would like them to behave by demonstrating this in your own behaviour towards them and others. This Survey has led to some really valuable insights into how modern parents are teaching their children right from wrong, at Room to Grow we’ve found the results fascinating. If you’d like access to the full data please complete our data request form. The data collected was anonymous and no personable identifying contact information was collected. Thank you to all the parents who took part.